Galvastar Galvanized Log Trailers are a great choice for a long lasting trailer that won't rust out like your typical steel trailer. Our rail & bunk trailers are hot dipped in 800 degree zinc to ensure a much stronger, longer lasting bond than painting can provide. Galvanized Log Trailers by Don Dens Trailer Sales are a great choice for the wood hauler who moves wood every day & has to have the very best. Our galvanized log bunks are available for either flat bed or rail trailer applications and are available with steel or aluminum stakes. We also offer replacement aluminum log trailer stakes that are designed to replace factory stakes on most log trailer manufacturer brands. 3"x4" stakes can be shimmed to fit OEM 3"x5" pockets. Aluminum end gates are available in standard or heavy duty configurations. Don Dens Trailer Sales has been selling used trucks & trailers for over 20 years and is your best local resource for used trucks, trailers & heavy equipment as well as trailer parts & accessories. Located in Carlton MN just off I-35, we're easily accessible & ready to help with any truck or trailer needs. 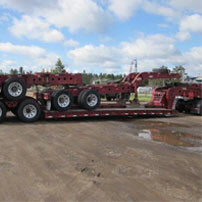 Whether you're looking for a log trailer, lowboy trailer or a retired army truck, Don Dens Sales has you covered!